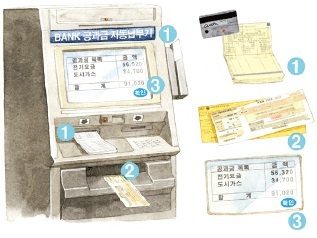 Banks in Korea are open from 9:30 am to 4 pm, Monday to Friday. ATMs (often called 365 Corner) are open at each bank after business hours. When you wish to open a bank account, go to the appropriate teller, and make sure you have your passport, Resident Registration Card and money for your initial deposit. Fill in the deposit or withdrawal form. Withdrawals require your signature and PIN number. You can deposit or withdraw money with your bankbook or bankcard from ATM machines. You can do this by bankbook or bankcard. If you wish to use your bankbook to deposit or withdraw money from the ATM, notify a teller, as they need to make some changes in your bankbook to allow you to do so. Withdrawing money with a bankbook or bankcard requires a PIN number. If the PIN number is entered incorrectly 3 times, you can’t use the bankbook or card. A fee is charged for the use of an ATM that does not belong to your own bank or if you use an ATM after business hours. You can do your banking online, but you will need a digital authentication from KFTC (Korea Financial Telecommunications and Clearings Institute), which needs to be saved on your computer. You also need a security card (sometimes called “secret card”) issued by your bank. You will need a card with a unique pass code issued by your bank and a PIN number. If you want to transfer money to your home country, you need to get the information about a bank account in your home country in the name of someone in your family. The receiver’s name, address, telephone number, name of the receiver’s bank and account number need to be given. Go to the foreign currency desk at the bank and show your Resident Registration Card. You can pay for the bill by visiting a bank with the bill. 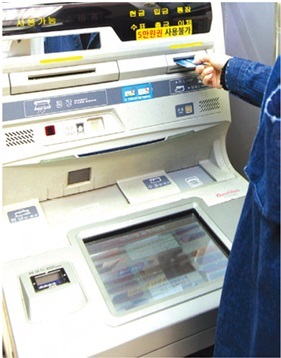 Nowadays, people like to use the automatic payment machine. You will need to have your bankbook. You can pay the bill by automatic withdrawal (money is automatically transferred from your account to the utility company). You can apply for this at the bank or by making a phone call to the utility bill issuer. Be sure you have enough money in your bank account to pay the bill, or there will be an additional charge for insufficient funds.